Super Smash Brothers has returned and is coming to the Nintendo Wii U and Nintendo 3DS in 2014! No word yet if they will be compatible with each other. The art style for the 3DS seems to differ from the console version. The 3DS version has a pastel look to it and the characters are outlined, perhaps to adjust for the smaller screen size.The Wii U version of the game however resembles Brawl. Given that the Wii U is an HD console, I am sure the characters will look cleaner and the developers will focus more on primary colors for their character pallets. We will also be seeing the return of the Smash ball and Smash attacks. Not much more information was given at the conference. However, here is everything that my great detective skills have acquired from the conference and other videos shown at E3. Let us begin Watson! Coming to us from the Wonderful world of Animal Crossing is the Villager! 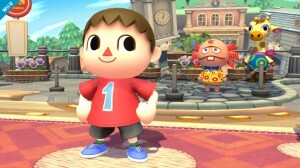 I was surprised this character hasn’t been added on during brawl but i guess with the release of Animal Crossing A New Leaf it would seem a perfect time for his presence in the game. The villager will have an interesting move set as well, for he is a collector and avid agricultural enthusiast in the animal crossing world, and I am sure he brought some of his tools. From the footage shown he brought out shovels and bowling balls to defeat his foes. At one point in the game he plants a tree, waters it, and than proceeds to cut it down on top of an enemy. Awesome! I Approve! Confirmed! RockMan (MegaMan) So Many Yes’s….. He is Perfect for Smash Bros! MegaMan is a great addition into the Smash Brothers universe. 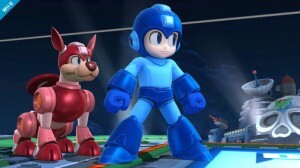 With his faithful companion Rush also joining his arsenal of attacks he will give megaman a diverse fighting style. To add to his move set he will also have many of his abilities that he attains from fighting his enemies like his metal blades, Crash Bombers, and Many more! MegaMan is gonna be a force to be reckon with, but with so many abilities he will definitely be hard to master since the developers focused on his Buster and will not have very little puching attacks. I also love that the developers kept his original look, he looks fantastic in HD. Welcome to the Team MegaMan, Capcom may not be showing you some love, Nintendo fans will! Yes, You heard right, the Wii fit Trainer is a character in the Smash Brothers! When I first heard about the news that trainer was a character i was stunned and concerned. I was not the only one. Other media outlets were appalled by the announcement and some fans even saying she is a waste of a slot. I however think otherwise, even though the trainer is an odd addition, i think it works. Ever since melee we have had one character stand out from the roster. In Melee we had Game and Watch and in Brawl there was R.O.B. The Trainer may seem out of place but it WORKS and I like it. I am sure being fit, healthy, and having a vast knowledge of aerobics will provide for another unique fighter. Here is a list of the roster, so far, that has been released. There have not been to many changes to the roster and we see some returning characters. You have Mario, Donkey Kong, Link, and Samus. Samus has undergone a costume change and have modeled her from her recent appearance in Metroid: The other M. Also back for more is Kirby, Fox, Pickachu, Bowser, and Pit. Pit has changed as well and now looks more like his appearance in Kid Icarus: Uprising. Pit will also have some new moves brought over from uprising. We will have to wait and see for more returning characters. Something i would like to see in particular with this game is costume selection. I know this has been done with alteration of colors schemes, but i would like to see character counterparts for some characters. For example a male fitness trainer or a female villager. We will just have to wait and see..
Now that we have received a first look at the game…Let the rumors and speculations begin. Super Smash Bros is said to be released in 2014 and you will finally be able to settle that feud. I am sure will will receive more information from this game as development progresses. So that is it! What do you think? Are you excited for more Smash brothers? Did you like the new character additions? If not which ones do you want to see? For more information about the game please visit the official Smash Brothers Website or stay tuned with us as we bring you the latest gaming information. See ya around Planeteers! can’t wait to play as some megaman!! what if Megaman’s smash was turning into ultra mega mega man?